Although the canals that were once claimed to criss-cross the surface of Mars turned out to be optical illusions, the ironic fact is that the Red Planet is riven by natural "channels" – the now-dry courses of running water. While clearly indicative of a watery past, these channels pose many questions about Mars' evolution and its potential for life. How much water would it have taken to make these outflow channels? Just what mechanism provoked these floods from within Mars' crust? Were Martian subsurface aquifers ever habitable, in the way aquifers are on Earth? Studies on Mars' youngest outflow channels, such as the publications listed below, help us answer these questions. Burr, D. M. (2011) Sedimentology in a reduced-gravity environment: Submarine analogs for streamlined forms on Mars. Geology, July 2011, v. 39, no. 7, p. 703–704; 10.1130/focus072011.1. INVITED. Burr, D. M., (2010) Palaeoflood-generating mechanisms on Earth, Mars, and Titan. Global and Planetary Change, 70, 5–13 (Special Issue, J. Woodward, P. Brewer, M. Macklin and S. Tooth, eds) 10.1016/j.gloplacha.2009.11.003. Burr, D.M., (2009) Paleoflooding in the Solar System: an interplanetary comparison. Global and Planetary Change, Special Issue (J. Woodward, P. Brewer, M. Macklin and S. Tooth, eds). accepted. Burr, D.M., L. Wilson, and A.S. Bargery* (2009) Floods from Fossae: a review of Amazonian-aged extensional tectonic megaflood channels on Mars. In Megaflooding on Earth and Mars, D.M. Burr, V.R. Baker and P.A. Carling (eds), Cambridge University Press, Cambridge, UK. Carling, P.A., D.M. Burr, T. Johnsen, and T. Brennand (2009) A review of open-channel megaflood depositional landforms on Earth and Mars. In Megaflooding on Earth and Mars, D.M. Burr, V.R. Baker and P.A. Carling (eds), Cambridge University Press, Cambridge, UK. Wilson, L., A.S. Bargery* and D.M. Burr (2009) Dynamics of fluid flow in Martian outflow channels. In Megaflooding on Earth and Mars, D.M. Burr, V.R. Baker and P.A. Carling (eds), Cambridge University Press, Cambridge, UK. Keszthelyi, L., R.P. Denlinger, D.R.H. O'Connell, and D.M. Burr (2007) Initial insights from 2.5D hydraulic modeling of floods in Athabasca Valles, Mars. Geophys. Res. Lett. 34(21), CiteID L21206, doi:10.1029/2007GL031776. Burr, D.M. and A.H. Parker* (2006) Grjotá Valles and implications for flood sediment deposition on Mars. Geophys. Res. Lett. 33, L22201, doi:10.1029/2006GL028011. Burr, D.M. (2005) Clustered streamlined forms in Athabasca Valles, Mars: Evidence for sediment deposition during floodwater ponding. Geomorphology 69, 242-252. Burr, D.M. , P.A. Carling, R.A. Beyer* and N. Lancaster (2004) Flood-formed dunes in Athabasca Valles, Mars: morphology, modeling, and implications. Icarus 171, 68-83. Burr, D.M. 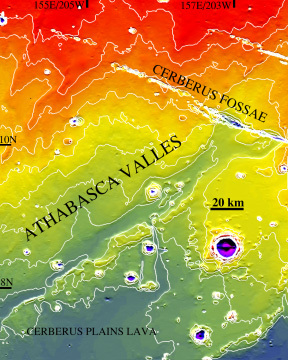 * (2003) Hydraulic modelling of Athabasca Vallis, Mars. Hydrological Sciences Journal, 48(4), 655-664. Burr, D.M. *, J.A. Grier, A.S. McEwen, and L.P. Keszthelyi, (2002) Repeated Aqueous Flooding from the Cerberus Fossae: evidence for very recently extant, deep groundwater on Mars. Icarus 159, 53-73. Burr, D.M. * A.S. McEwen and S.E.H. Sakimoto (2002) Recent aqueous floods from the Cerberus Fossae, Mars. Geophys. Res. Lett., 29(1), 10.1029/2001GL013345. Burr, D.M. and A.S. McEwen, (2002) Recent extreme floods on Mars. In: The Extremes of the Extremes: Extraordinary Floods (ed. by Á. Snorrason, H. P. Finnsdóttir & M. Moss) (Proc. of a Symp. at Reykjavik, July 2000). Publ. no. 271, IAHS Press, Wallingford, Oxfordshire, UK.